15209. Sheridan, Sarah. 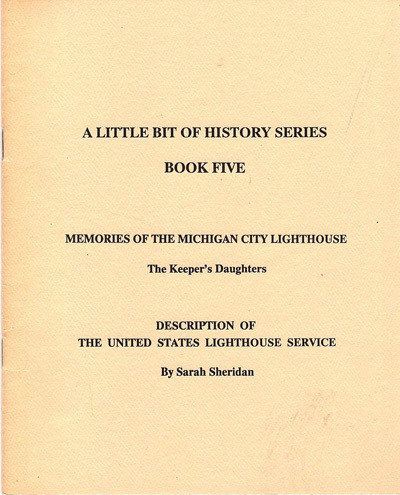 Memories of the Michigan City Lighthouse – The Keeper’s Daughters, with appended Description of the United States Lighthouse Service. 1991. Michigan City. 20p. Soft wraps. Wonderful account of growing up at the Michigan City Lighthouse in the 1930’s by Keeper Ralph Moore’s three daughters Jean, Betty and Eleanor. Also includes account of the work of the Lighthouse Service in the region. Clean, good copy. (VG+). $22. 2735. Lot 6 Booth Tarkington (1869-1946) related photos) c.1936. A native of Indianapolis, student at Princeton (Class of 1893), was perhaps Indiana's most famous author, both as playwright and as novelist. His best-known works were written in the first decades of the twentieth century: The Gentleman from Indiana (1899), Penrod (1910), Seventeen (1917), The Magnificent Ambersons (1918), and Alice Adams (1921). The last two won Pulitzer Prizes. The 1921 Publishers Weekly poll of booksellers rated him the most significant contemporary American author, above Sinclair Lewis, Robert Frost and Carl Sandburg. His short story, "Cider of Normandy," won the 1931 O. Henry Memorial Award. Tarkington was married twice. His first marriage, in 1902 to Laurel Louise Fletcher, ended in divorce in 1911. In 1912 he married Susanah Kiefer Robinson of Dayton. During their later years, the Tarkingtons spent about half of each year at their home in Indianapolis and the other half at Seawood, the home they developed at Kennebunkport, Maine. The home at Kennebunkport included, besides the house, a schooner- the Regina, and "The Floats," a boathouse to which Tarkington went afternoons for coffee and conversation. Writer Kenneth Roberts was a close neighbor and friend. The boathouse is now the Kennebunkport Maritime Museum/Gallery. 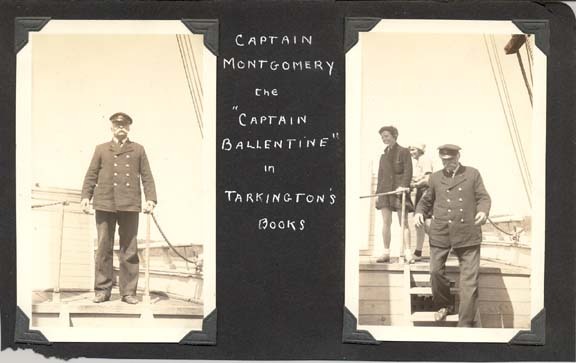 Lot includes six photographs removed from an album and include views of the schooner Regina, Mrs. Fog, Tarkington’s nurse, and of Captain Montgomery, who was the inspiration for “Captain Ballentine” in Tarkington’s books. The views of the schooner Regina, owned by author Booth Tarkington, show her docked on the Kennebunk River. This schooner served as Tarkington's summer studio as well. Two views show scenes of Booth's shipkeeper or captain, on deck of the Regina, in the 1930's. All in excellent condition, very sharp and clear, perfect for framing. (VG+). $64. 14297. 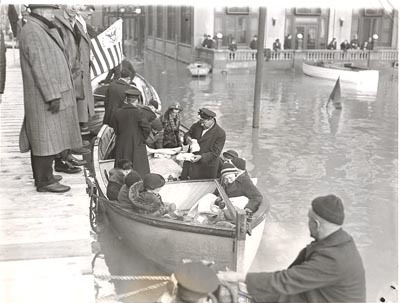 (photo) Flood Relief, Evansville Indiana c.1937. Clear, close original 7” x 9” press photo shows great detail as Coast Guardsmen load nurses into the motor surfboats for transportation to flood-isolated towns where refugees were in need of medical attention. Photo is b/w and includes date and description on back. Nice view of boat. Clear and close view. Dated January 28, 1937. (VG+). $44. 2878. 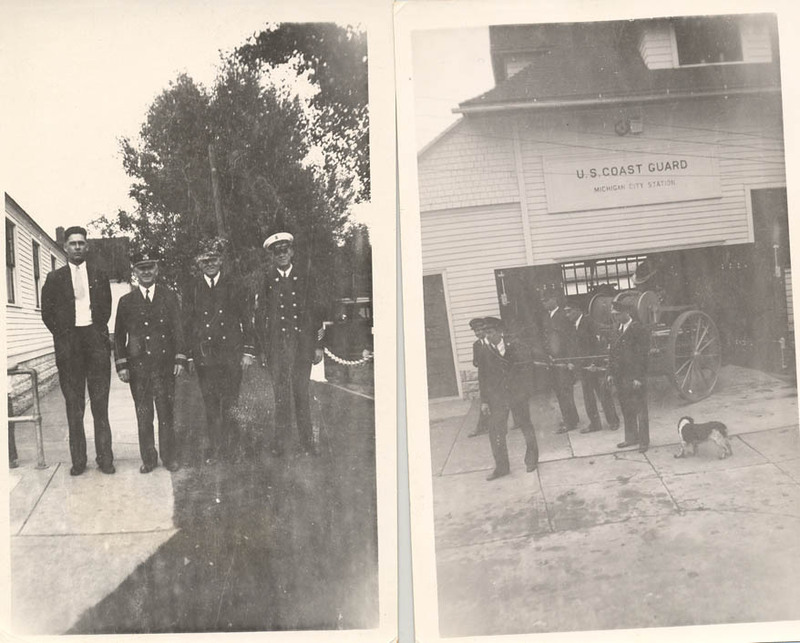 (lot 6 photos) U. S. Coast Guard Station, Michigan City, Indiana c.1920-30. 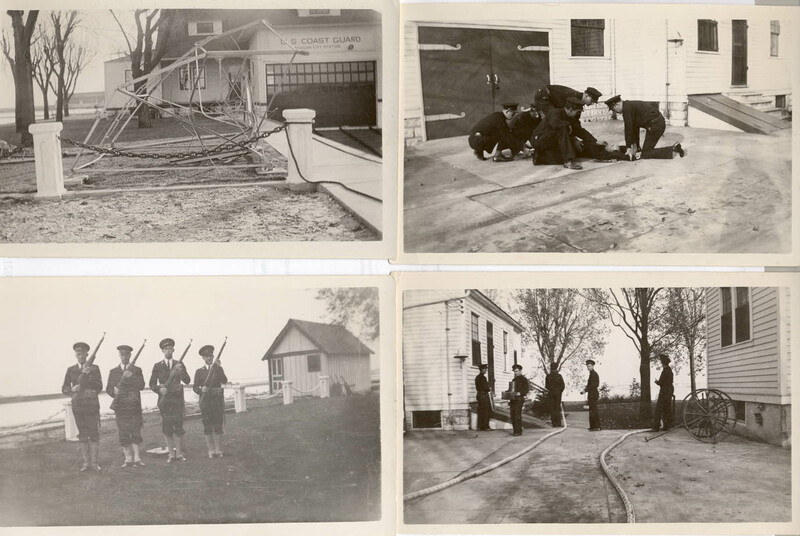 Excellent lot of early Coast Guard views of the crew at the Michigan City, Indiana lifeboat station. Views are close and clear and show the crew drilling or posing including resuscitation drill, close order marching, fire drill with hose cart and playing stream, posing with beach apparatus cart, wreckage of collapsed flag signal mast, officers posing. Views measure 3 ¾” x 6” and are b/w. Great set. (VG+). $84. 21126. 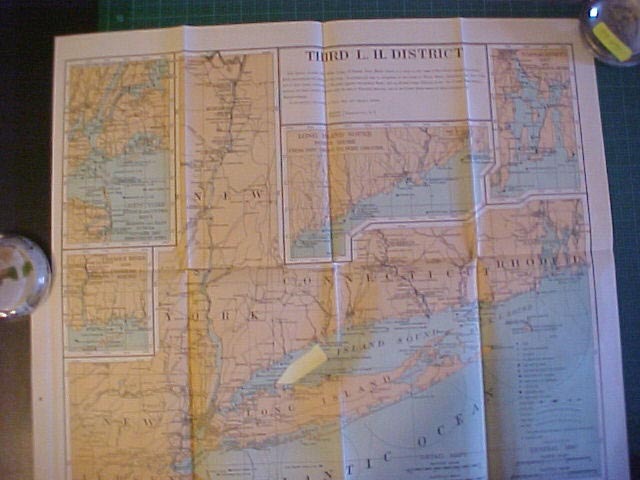 South Bend Replicas, Inc., CATALOGUE OF ANTIQUE/REPLICA ORDNANCE. South Bend , Indiana . 2004-2005. 130p. Soft wraps. South Bend Replicas are the manufacturers of solid-cast machine-bored cannon for display and actual firing. Included among their inventory are 1878 style Lyle gun barrels used by museums around the country to demonstrate the breeches buoy drill of former life-savers. J. Paul Barnett, owner of the company, is one of the foremost experts on the subject of cannon and particularly those developed by David Lyle. Their catalogue provides thousands of photographs and extensive text describing all manor of cannon, present day construction processes to provide authentic reproductions, and much about safety in the present day demonstrations of these pieces. Interesting reading as well as a great reference. (M). $10. Page updated November 28, 2015 . 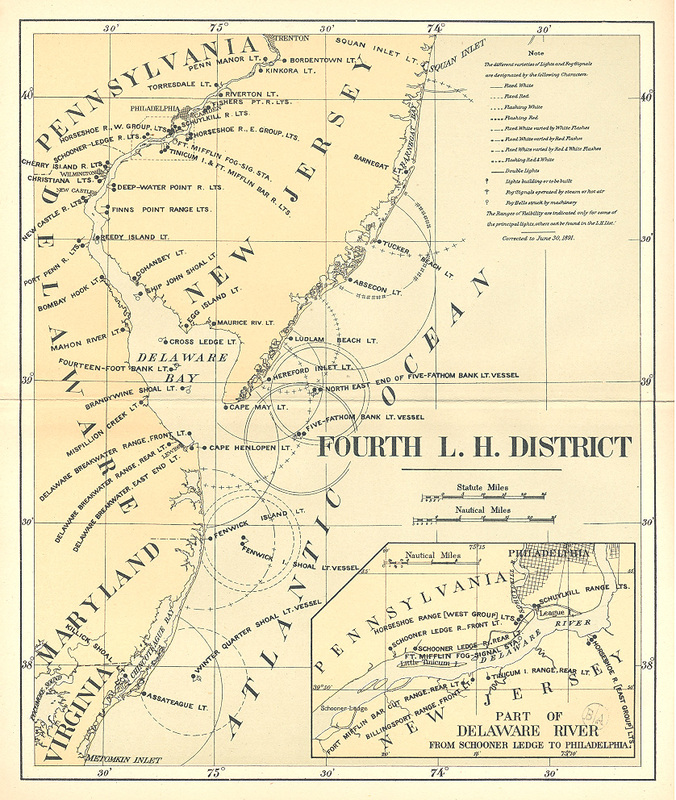 All text and illustrations on web site Ó James W. Claflin . 11/28/2015 All rights reserved. Use prohibited without written permission.